No doubt I have conne cted with and photographed Nepalese who are now dead. Maybe my guest house owner in a very old section of town, who took me to the hospital when I was sick. Or the young, possibly homeless girl, chewing flavored ice before feeding it to her small puppy on the steps of an old temple in Patan, a site of horrendous destruction. Or the striking Brahman woman from whom I bought some jewelry and shared laughs at the Hindu river site now overflowing with funeral pyres burning the bodies of the dead. Or Ang Dawa, the Sherpa guide with whom I sat for hours to plan our Himalayan trek (before canceled by illness), who had little formal education growing up high in the Himalayas yet so wise…was he caught trekking in the mountains and is his extended family in the village where he played when young now buried by avalanche? To great relief, my friend Amee answered my email. The young nurse is safe and finally back home after 5 days of caring for the injured & sick in the streets of Kathmandu. 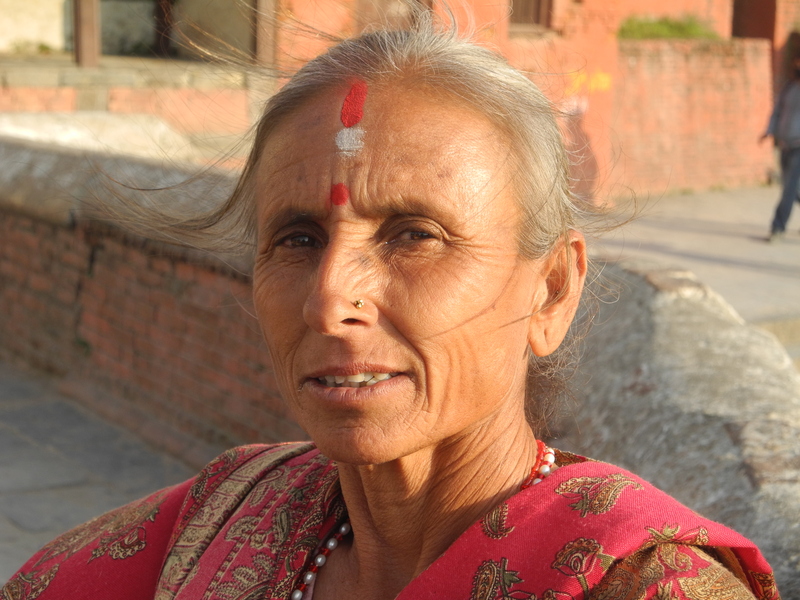 Five weeks ago she introduced and guided me through the medieval cities of Kathmandu Valley that are now rubble. My yearning is to go to Kathmandu to help, in reality to assuage my own feelings of helplessness. Myanmar…While I usually travel alone, I was joined on my 4 week journey through Myanmar in February by my friend Mirella (an Italian living in France for past 20 years), who I first met in 2009 at the Glen Ivy spiritual community in southern California. We were amongst the snow birds that flocked there each winter to soak up sun and loving connections with the community. I travel independently, which means that I have a general idea of where I want to go before I leave home, and then make specific lodging and transportation plans as I go. I have an old SE Asian cell phone and get a new SIM card and minutes for a few dollars when I arrive in each country. This was particularly essential in Myanmar where the internet was so slow that it was impossible to even book any hotels online and at times I had no internet service at all. All the people I met there called their country Myanmar while many of us in the US, including myself and our government, refer to it as Burma. I did not see many Americans there. Most tourists are European, Chinese or Japanese. Some 90% of the 55 million Burmese are Buddhist, with their pagodas and stupas dotting the urban and rural landscape. The People are very warm and friendly, especially when you get beyond Yangon (Rangoon) and Mandalay, where the fierceness of surviving in an urban environment can taint their natural spirit of generosity and big smiles. Most Burmese outside the tourist zone knew very little or no English. Ming-gu-la-ba (hello) softens and brings smiles to almost all Burmese. But my linguistic skills did not end there. Adding chey-zu-bay (thank you) almost always enhanced my charm with more smiles. A simple connection. Usually I forced myself to stand before Burmese in interminable silence until I could recall those words, committed to mastering this “language” or else die from self-exposure. You can now understand my great relief that “toilet” had instant international recognition. Spent lots of time walking the streets and markets, and after asking permission, I would photograph people and then have them view the photos. Often they would summon their friends or co-workers to join them with lots of smiles and laughter until the camera focused on them, when they often posed somberly…until I “tickled” them from afar. What fun we had. Often pleasantly lost, I would stop folks on the street or shop owners to ask for directions with a delightful merging of English & pantomime. Frequently these warm-hearted people would stop what they were doing and guide us to the destination we sought. One day we arrived at a restaurant for lunch, only to discover that it was closed for a private wedding reception. But the newlyweds and guests insisted we join them and all delighted in posing for photos with the foreigners. Who ever said there is no free lunch. We spent a lovely day on a wooden boat we rented with driver on the shallow Inle Lake, a wonderful tourist destination of villages on stilts with floating gardens and Intha fishermen, who balance on one leg at the stern of small flat-bottomed skiffs propelled by wrapping the other leg around the oar. In late afternoon as our boat was slowly passing another boat full of Burmese, I was looking over at them and found myself questioning if I should wave, if this foreigner would be intruding on their space. As I watched them, first one, then another began waving. I gladly responded. Then a boy stood up and began making dance moves, to which, of course, I responded in kind albeit more gingerly. Soon we all began to laugh and wave…sharing a precious moment as I took their picture to more smiles and waves. Many Westerners I overheard seemed to give focus to the poverty of the Burmese, whereas I experience a traditional people not yet (too) tainted by the lure of western capitalism and need for material wealth, who have an inner wealth in spirit & open hearts, and the gift of living in the present moment without the Western scourge of “shoulds” with which I grew up. Yet we are both wearing glasses from afar…I’ve just traded in the dark lenses for my preferred rose-colored ones. Visit to Myitkyina (Meet-cheena) in Kachin State in northern Myanmar. Getting there was informative. The 340 mile trip from Mandalay translates into a 19 hr van ride or 24 hour bus ride or 25-40 hour train ride. We opted for an hour plane ride. Few tourists go there. The Kachin Independence Army (KIA) has been fighting the Myanmar military for many years and controls substantial portions of the Kachin State, including income-generating jade and other mines in this rugged resource-rich region bordering China and India. There are about 100,000 Kachin (maybe 10% of population) displaced from their villages due to fighting, with numerous UN camps established near the capital Myitkyina, which is quite safe. The Kachin people are also mostly Christian with the majority being Baptist (American Baptist missionaries first arrived in Burma in early 1800s and in Kachin State in the late 1800s). I had arranged to do volunteer work before leaving home. I worked with the Kachin Education Foundation (KEF), an NGO created by the Kachin Independence Organization (the political arm of their independence movement) to establish child-centered schools that would teach Kachin language, culture and history while creating a “user-friendly” learning environment totally opposite from the government schools, which demand absolute obedience, no questions allowed, rote memorizing that is regurgitated back on exams and regular hitting of kids with sticks and paddles. One vivid example told to me was about a first grader who in doing an assignment forgot to leave a space between lines as instructed. This six year old was traumatized when suddenly struck with a stick for not following instructions. We toured 2 new schools being established and my interpreter reported, when I asked, that he was hit regularly with a stick across the back of his hands and buttocks. As an aside, I was told that this system of learning was introduced by the military regime that ruled Burma since the 60’s. Yet I later discovered that gov’t schools in Nepal and India used the same system, which leads me to believe that the British, who ruled these 3 former colonies, probably initiated this system. The mission of KEF is to establish 100 of these child-centered schools in the next 5 years. Since they were without a dependable source of funding, I focused my work on preparing a fundraising plan, which I centered on strategies for identifying and meeting with influential Kachins with access to funds, then getting them to tour the new schools. Kachins were educated in gov’t schools, which left an indelible mark on their psyches. Looking into the bright eyes of students at the new schools will instantly pluck on an emotional chord that should convey the vital importance of these schools. The funding should then be much easier to achieve…I say confidently from my comfortable perch half-way around the world. I also prepared a chart to help them determine how many teachers will need to be trained each year given the annual geometric increase in classes. Days before my arrival in Myitkyina, two Kachin woman in their early 20’s, who were volunteer teachers in a new child-centered school in a remote area, were raped, tortured and murdered by two Myanmar soldiers. While unclear if they were ordered to do this, the military did quickly remove them from the area for their protection. This Kachin mother of eight, whose name regrettably I do not remember, founded some 20 years ago Grace Happy Land orphanage which now serves 90 children. Although frequently unsure where the resources for the required food, clothing, school fees, etc. would come from, she has prayed and whole-heartedly trusted that God will provide, and, by God, someone has always shown up at her door with unexpected funds or supplies. And her infinite love and caring for these children is reflected in their eyes. Trash…a new phenomenon. Throughout thousands of years the Burmese people had never encountered items that wouldn’t disappear back into the earth…until several decades ago when plastic water bottles and bags began to appear and wouldn’t disappear. So they can now be found strewn along paths and roads, in empty lots and corners. I saw no sign of any trash collection systems or educational campaigns. Hopefully the political changes occurring on the national level, with democratic elections to be held this November, will produce elected local governments & leaders to address these issues, which are beyond the ability of national gov’t to resolve. country. A new mayor, after finding local laws ineffective, went into the schools with his wife and initiated a successful campaign to get the children to take the lead in cleaning up the city…and undoubtedly shaming their parents. Puerto Princesa is now the cleanest city in the Philippines. Traffic & Travel. Travel on the many mountainous roads is slow and arduous. Most tourists fly between destinations. I was told that in the 1960’s the military leader who took control of the country woke up one day with a premonition that he would die in a car driving on the left side of the road. He immediately promulgated that all traffic would hence forth drive on the right side of the road. Yet after some 50 years, about 80-90% of all cars, trucks and buses still have the steering wheel on the right side. And this is in a country where roads are cluttered and faster vehicles are constantly passing slower ones…if only drivers could see what’s coming before turning into oncoming traffic. Fortunately, vehicles don’t get above 40 mph and opposing traffic yields without resentment…always marveling this American. Train tracks are in such a poor state that trains carry a track crew to make repairs as needed. I have a great confidence-inspiring photo of one track crew repairing track about 30 feet in front of the passenger train engine at the beginning of a railroad bridge crossing a 200 ft. deep ravine. Seems rather fortuitous that the engineer spotted that particular track problem! It’s all about who you know. While walking one Saturday evening in a beautiful park with charming lake and pagoda in Yangon, I twice that evening observed SUVs with flashing lights on their dash boards racing at high speed along the narrow park road jammed with pedestrians without even the courtesy of beeping their horns. I was amazed no one was hit. Later my taxi driver told me those cars belonged to sons of either Generals or high ranking government officials, and police were too scared to stop them. Bagan is a World Heritage Site with over 3,000 Buddhist temples dating back to 11th-13th century, reminding me of Angkor Wat. What I was not prepared for was to behold in the midst of these historic temples a “signature” 10-story hotel recently built to resemble a temple. This exception to the sacred rule of no modern buildings on a World Heritage Site was brought to you by a General who gave his blessing to his friend to build this hotel there…and I assume received a large deposit in his Swiss bank account.